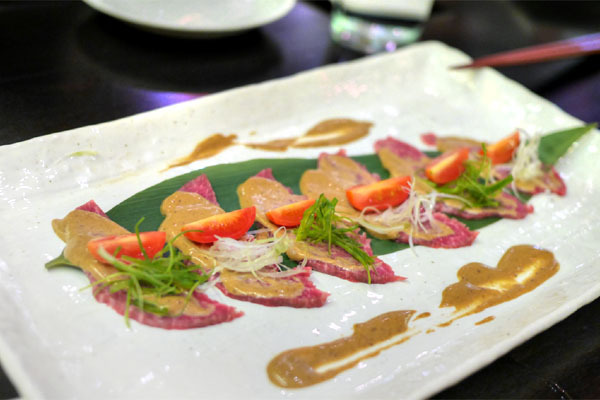 One of the more unfortunate shutters of 2014 for me was that of b.o.s., the highly-regarded but never-that-popular beef-centric restaurant from Jun Isogai and Chef David Bartnes. The eatery closed in September, lasting just under a year. 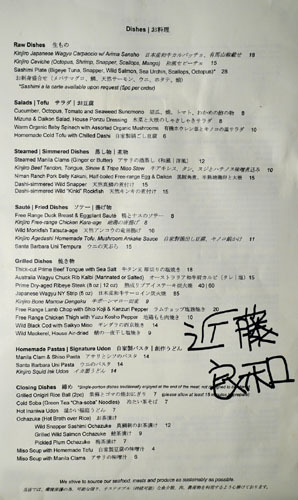 In its place, however, comes a nomiya (tavern) concept from Isogai, one touting modern, artisanal izakaya-style cuisine. 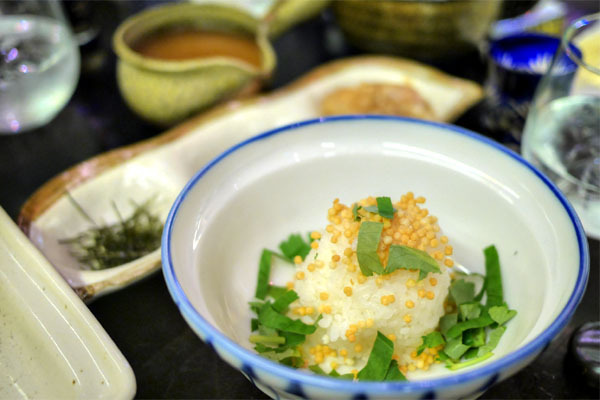 Named after a 19th century agricultural-focused statesman, Kinjiro soft-opened in mid-November and features the cooking of Chef Yoshikazu Kondo. About the Chef: Kondo hails from Tokyo, but received his culinary training in France, Italy, and Spain in addition to Japan. He came to the United States in the eighties, and soon found himself at Chaya Venice under Executive Chef Shigefumi Tachibe. He eventually rose to the rank of head chef, a position he held until at least 1996. From there, Kondo-san bounced around various Japanese restaurants in Little Tokyo, including the now-closed Izayoi just down the street. His last position was that of second-in-command at b.o.s., so it was an easy transition for him following the place's closure. Decor-wise, things haven't changed too much since the b.o.s. days. Major updates include the shelving out front (holding spent bottles of booze) and the large specials chalkboard in the back. 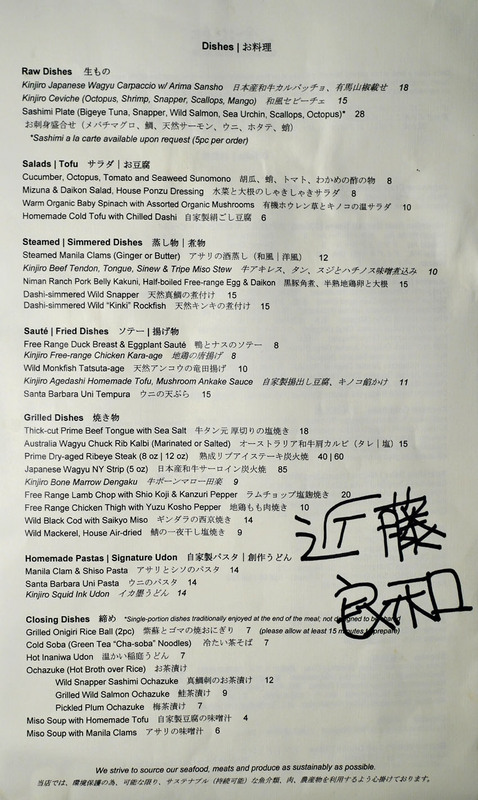 Kinjiro's menu lists an appealing array of dishes in various categories, mostly classic, but with a few twists thrown in for good measure (note the italicized items). This is joined by a sheet of daily specials, which you'll want to pay close attention to as well. 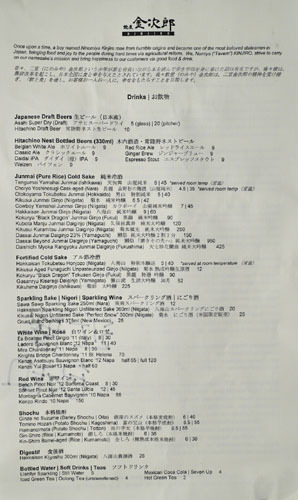 Drink-wise, there's a pretty healthy list of sakes, one that includes a few more unusual selections that you don't see too often. Other options include a handful of Japanese beers, shochu, and the requisite wines. Click for larger versions. 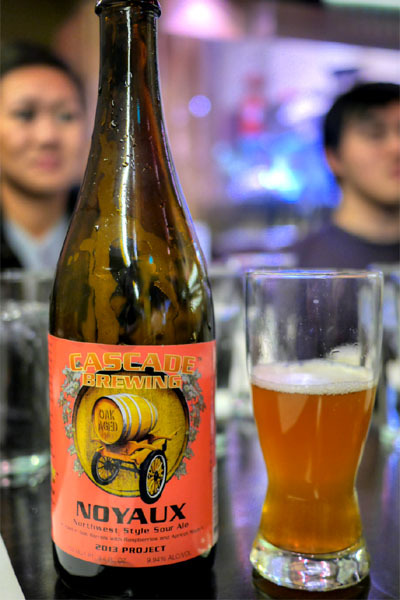 Given that corkage was graciously waived this evening, we brought out the beers, starting off with the 2013 Cascade Noyaux, a sour blonde aged in oak for 14 months, then rested with raspberries and apricot noyaux (seeds) for another seven. The result of all that was on the delicious side, a deft blend of sweet, tart, floral, and funky notes lined with hints of nutty oak. We began with a tasting of Kinjiro's "signature" items. First up to the plate was one of the tastiest carpaccios I'd had in a while. Made from chuck, the slices were appropriately beefy, and expertly balanced by the onions up top while the arima sansho added a wonderfully spicy counterpoint that brought it all together. 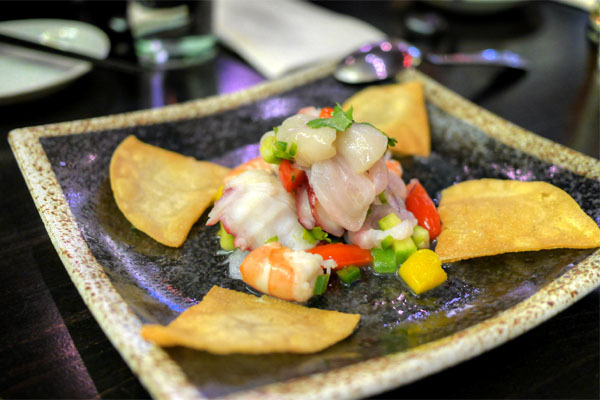 The restaurant's riff on ceviche delivered as well. I appreciated how each item of seafood was well-textured and distinct, yet cohesive, tied together by undertones of sweetness, spice, and herbaceousness, with a hit of yuzu on top. Nice bit of crunch from the included chips, too. Kinjiro's karaage comes in a rolled, maki-like presentation, a higher-class touch that you rarely encounter. It wasn't just about looks though, as the chicken really satisfied, a juicy, flavorful bird with super savory skin and a great accompaniment in the form of that zippy sauce on the side. 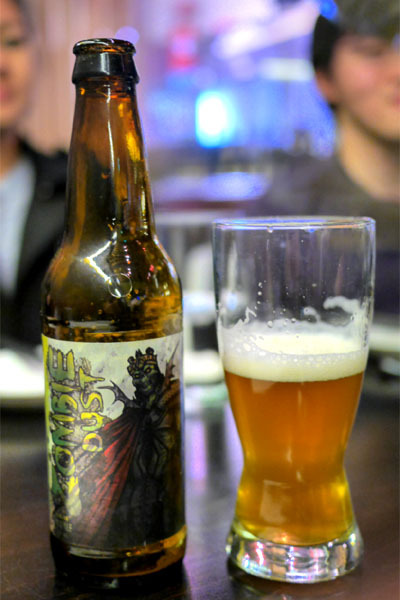 Next up to drink was the much-hyped 2014 Three Floyds Zombie Dust, oft regarded as the pinnacle of the American Pale Ale style. It was indeed a superbly-crafted beer, with a nose redolent of tropical, floral fruit intermingled with hops and a taste loaded with citrus fruit, a touch of malt, and more pine-y bitterness. I'd still give the edge to its closest competitor, Toppling Goliath's PseudoSue, though. The age tofu was another winner, and a legitimate challenger to Raku's hegemony in the space. We adored the combination of sweet and earthy mushroom flavors against the mildness of the curd, and the nori on top was a perfect accent piece. Texturally, think silky and supple on the inside, with some chew on the skin. This is one you probably want to get. 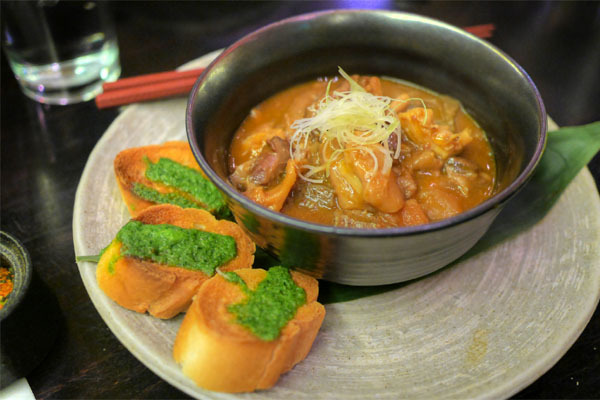 Kinjiro's offal stew was also a pleasant surprise, with its deep, earthy flavors and myriad of textures making for a hearty course that paired gorgeously with the green, seaweed pesto-like condiment on the side. I'd purchased the 2013 OWA Yuzu Lambic a while back, and had been waiting for an opportune time to pop it. 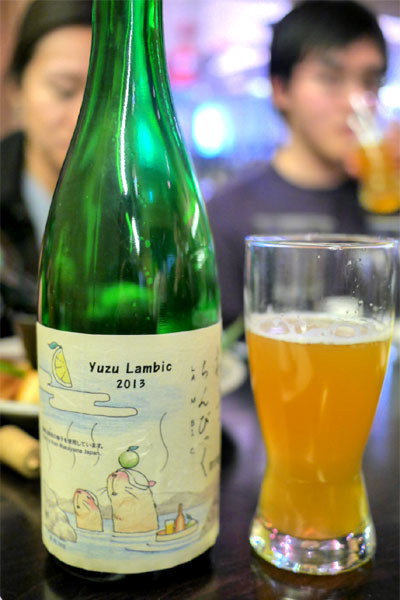 Produced in Belgium by former Kirin brewer Leo Imai, the beer is comprised of fresh, one-year, and two-year wood-aged lambic, blended and matured for another year with the zest of Wakayama yuzu. The nose was intense with intoxicating aromas of citrus and spice; on the palate I got more sour yuzu, joined by a surprisingly pleasant salty, almost gose-like backbone. Clean and refreshing, and a bit more nuanced compared to the MAD Beer Sour (Sur) I'd had not long ago at Tokyo Fried Chicken. 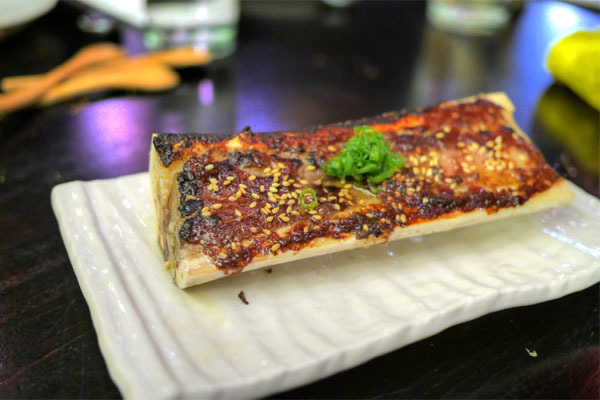 This is of course the first time I'd had bone marrow done dengaku style, or miso-glazed and broiled. 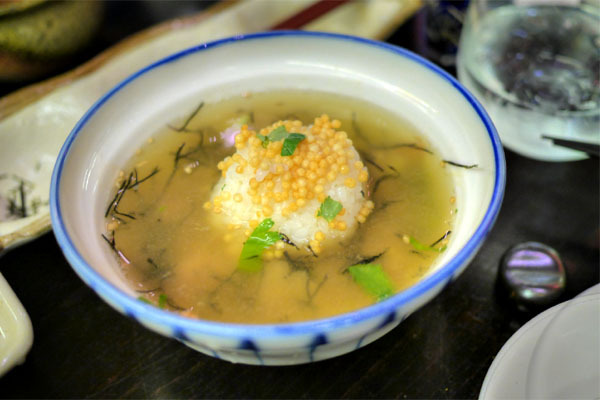 It worked out for the better though, with the trembling, gelatinous tissue conveying a richness that really linked up well with the sweet-savory nature of the miso while scallions on top offered up a blast of countering astringency. Udon was soft and slippery, good to the bite and teeming with briny, ika sumi-enhanced goodness. Great texture on the rings of squid as well, and we were quite enamored by the chopped up bits of the cephalopod here too, which added a well-placed chewiness and savor to the pasta. 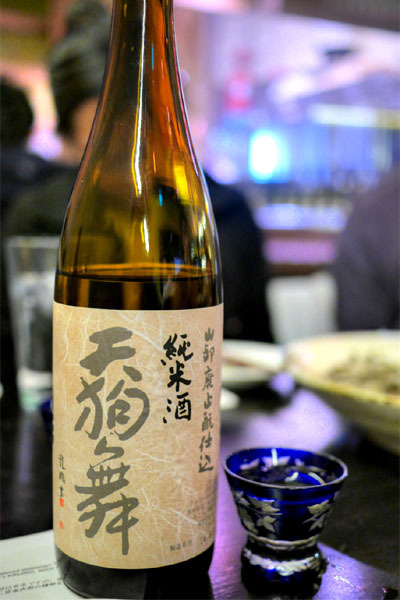 At this point, we ordered up a bottle of sake, the Tengumai Yamahai Junmai [$45] from Ishikawa Prefecture's Shata Shuzo. We really enjoyed it, finding it super ricey and floral on the nose and smooth, clean, and flavorful on the tongue, with just a smidge of heat toward the rear. A great value to boot. This might've been my first time having sea cucumber in raw form. 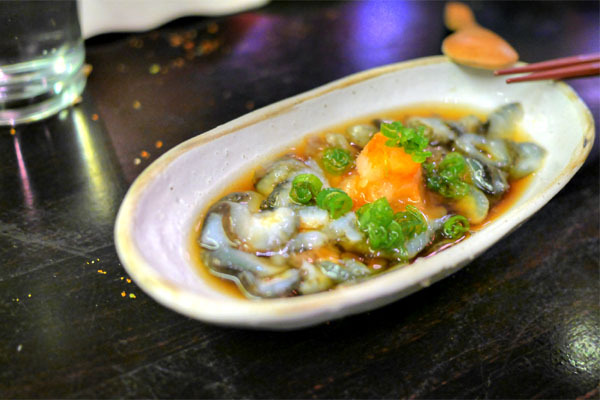 Taste-wise, the namako didn't offer up much, so it was all about the heat of the momiji oroshi and tangy ponzu to go along with the crunchy, slick consistency of the delicacy. Regular readers will know that I'm a sucker for potato salad, and the version tonight was certainly one of the stronger ones I've had. I loved the smoky, salty slant of the dish, and how the salad closed with a subtle, yet persistent undercurrent of wasabi heat. Seemingly simple, but gratifying. 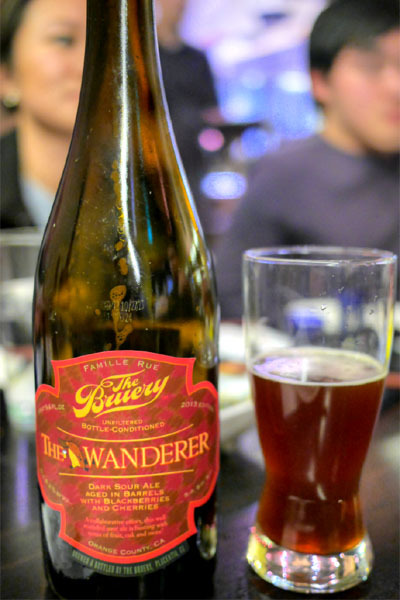 Moving on to another sour now, here was the 2013 The Bruery The Wanderer, which I'd wanted to try for a while now. It's a blend of oak-aged sour ale and the brewery's anniversary ale, with blackberries and Bing cherries added, produced in collaboration with San Francisco's City Beer Store. It smelled pretty fantastic--tart cherry and funk--and tasted even better, with loads of black cherry flavor, oak, malt, and a lactic sort of tartness, the whole thing finishing dry. 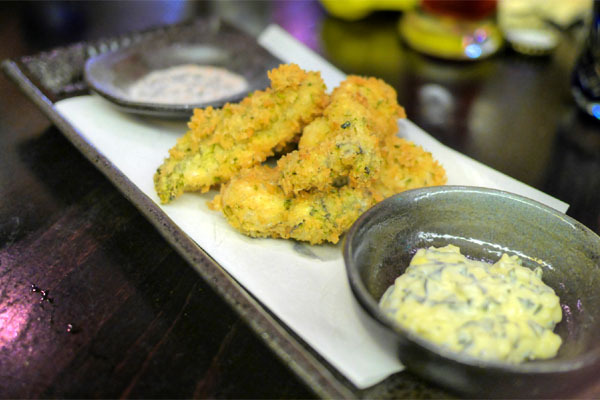 Baby oysters were lightly fried, their subtle salinity nicely augmented by the savoriness of the aonori batter. 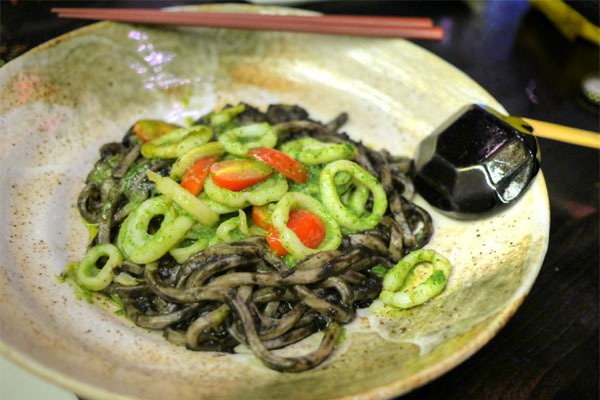 Excellent when taken with the richly-flavored wakame seaweed "tartar sauce" on the side, which did a great job in completing the dish. 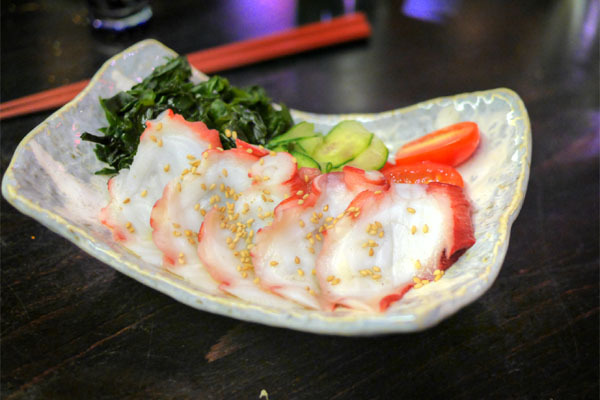 A vinegared salad of sorts served as a fitting palate cleanser, the beautifully-textured slices of octopus highlighted by the nuttiness of sesame while the tangy veggies provided the desired levity. 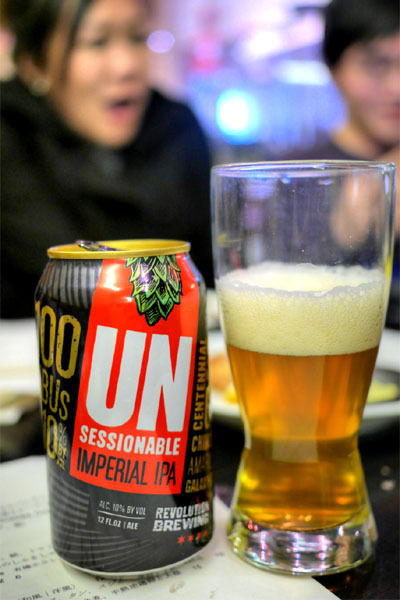 IPA duties tonight were handled by the 2014 Revolution Brewing Unsessionable, ostensibly a middle finger to the burgeoning trend of session (low ABV) beers. Loads of bitter, pine-y notes on the nose here. The aroma belied the palate though, which I found particularly malty and caramel-laced, making for an easy-drinking tipple. 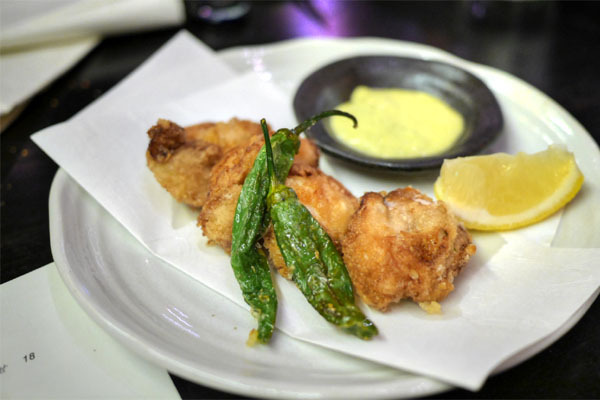 One of the tastiest bits of monkfish I've had came in the form of these tatsutaage, fried fritters that really showcased the meaty, satisfying texture of the anko. Excellent with a dab of the wasabi-tinged sauce on the side. I believe that this was my first encounter with tempura'd urchin. 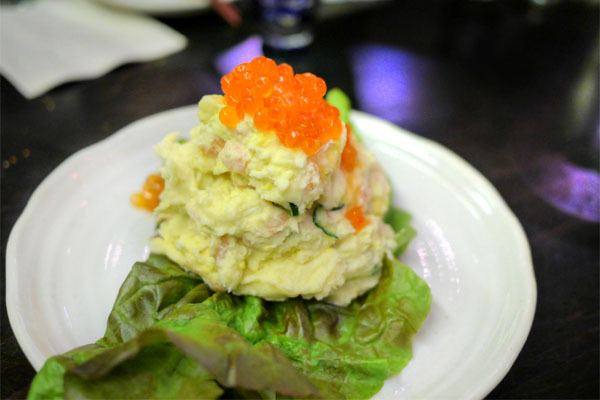 The frying process seemed to minimize the creaminess of the roe, instead accenting its savoriness, taken against a wrapping of minty shiso. I appreciated the light batter on the other items included here as well, and everything went well with a blot of matcha salt. Kinjiro's take on kakuni was on point, with the belly coming out chopstick-tender, but still with a nice bit of bite to it. 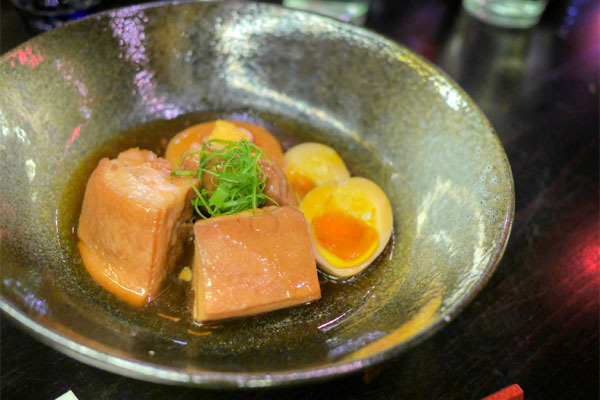 You got all the deeply porky, savory-sweet flavors that you'd expect, with the added benefit of the runny eggs and a puck of daikon to even things out. 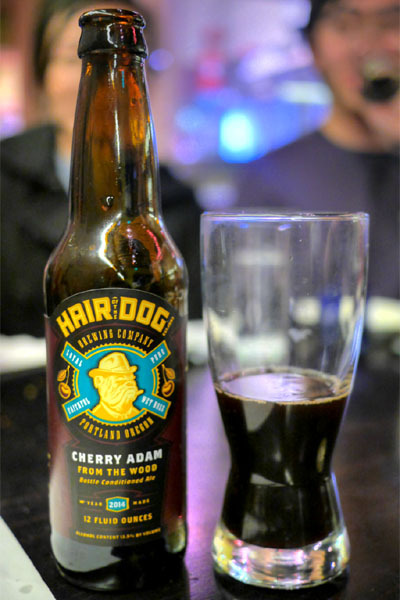 And now for a headier brew: the 2014 Hair of the Dog Cherry Adam From The Wood, an old ale brewed with cherries and aged in oak for 15 months. It was one of the silkiest beers I'd had in recent times, with a base of chocolate, malt, toffee, and barrel qualities intermingled with a subdued amount of sweet-tart cherry. 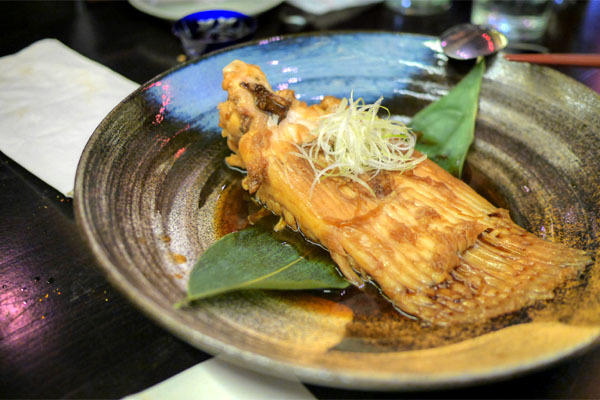 Stingray wing was delicate and almost crab-like in consistency, imbued with classic flavors of dashi, the bevy of subtly sweet, umami-rich notes working hand-in-hand with the zesty onions on top. 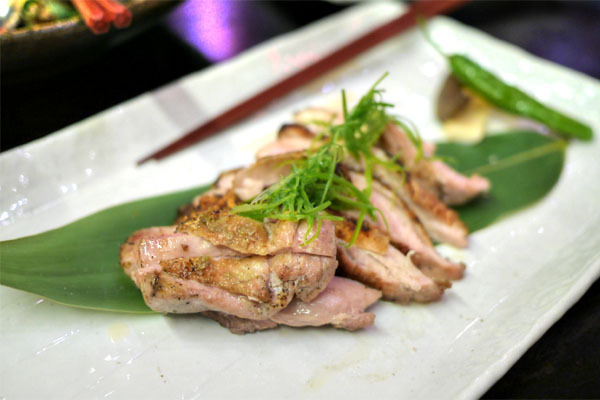 Chicken thigh was a crowd pleaser, the juicy, flavorful cuts eating superbly with the salty spice of yuzukosho. Can't go wrong with this. 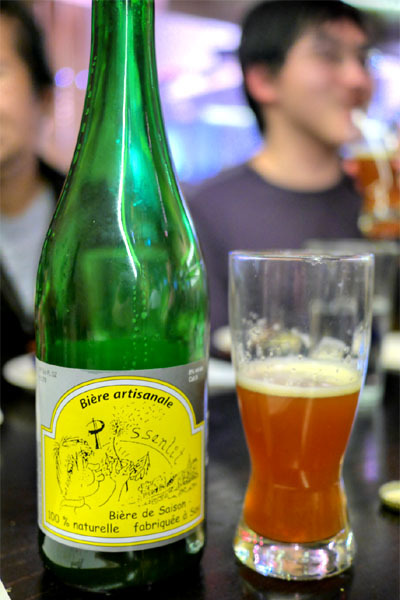 The 2014 Fantôme Pissenlit was a Belgian ale done in the saison style, brewed with dandelion flower "tea." It was certainly more interesting than your usual farmhouse ale, surprisingly malty on the nose, with grassy, spicy flavors and a fruit-like sweetness. Here was a spot-on rendition of the ubiquitous tara no saikyo yaki. It was more refined than most, with the flaky, fatty fish conveying a restrained salinity that paired swimmingly with the miso's inherent sugariness. 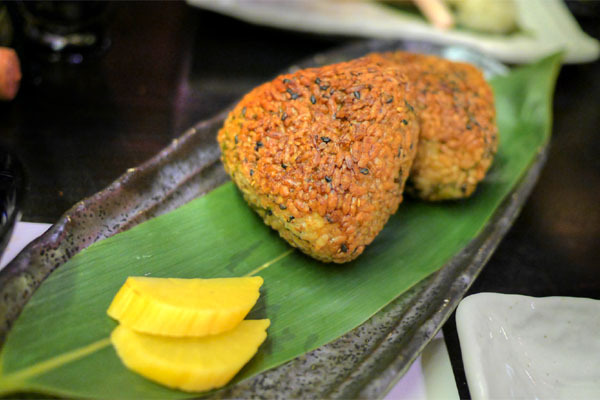 The onigiri were excellent, with a fantastic nutty, toasty character from the grilling that really complemented the rice. Nice crunch from the takuan, too. 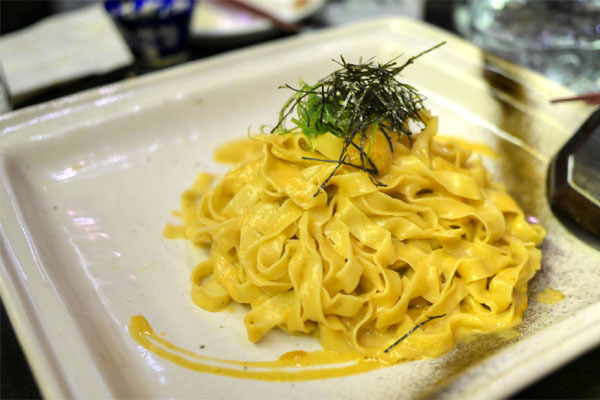 Kinjiro's take on the quintessential Japanese pasta dish displayed a nuanced presentation of the star ingredient, with the uni's lush, creamy nature melding with the nori on top in seamless, classic fashion. 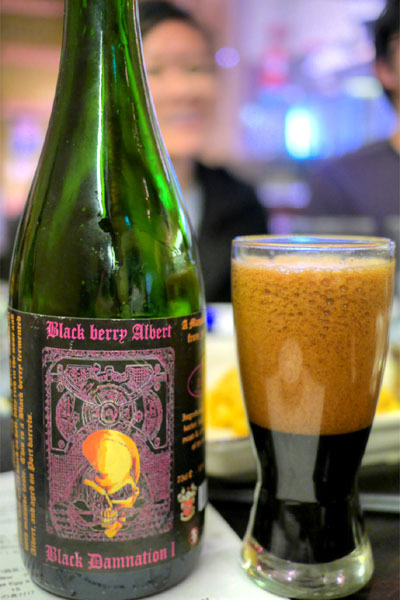 The heftiest drink of the night was the 2013 De Struise Black Damnation I - Black Berry Albert, a blackberry-fermented imperial stout aged in Port barrels. It was a tasty one, with a distinct dark fruit character and a good amount of vinousness dominating over a base of stout goodness. Up next was an excellent example of ochazuke, probably the best I've had in fact, a homey, well-integrated dish that smartly incorporated the rare slices of fish. 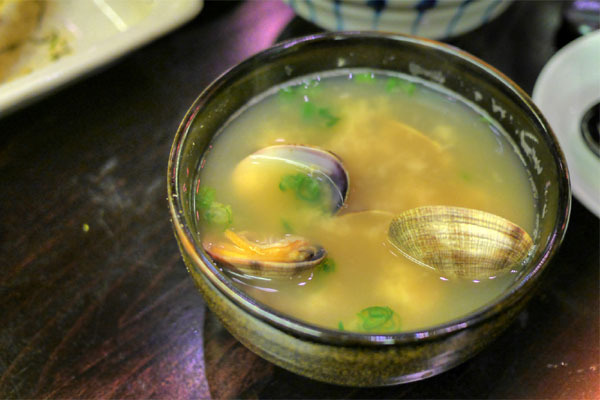 We ended the savories, fittingly, with a classic miso soup, one amped up in intensity by the incorporation of those clams. 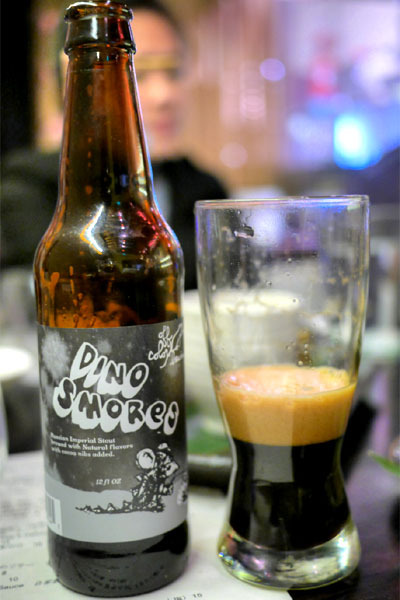 The final beer definitely went in a more dessert-y direction: the 2014 Off Color Dinosmores, an imperial stout made with graham flour, marshmallow fluff, vanilla, and cocoa nibs. It really did recall its namesake treat though, with loads of marshmallow-y goodness joined by notes of chocolate, roast, and a subtle graham cracker character. Dessert time; and you can be sure that we got all three on offer. 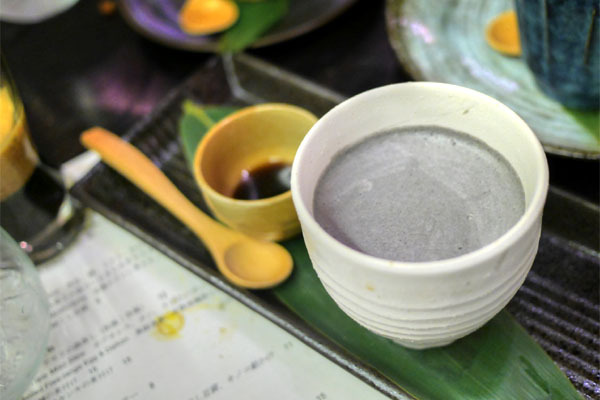 The black sesame mousse was a winner, really conveying the focused, robust essence of kuro goma in a creamy package while the kuromitsu syrup on the side imparted additional sugariness to the fray. 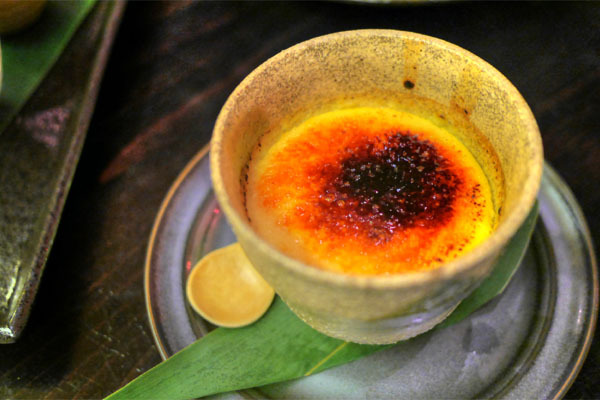 Sake kasu was the star of the crème brûlée, providing a delightfully earthy, ricey, boozy flavor to the cheesecake-like custard. 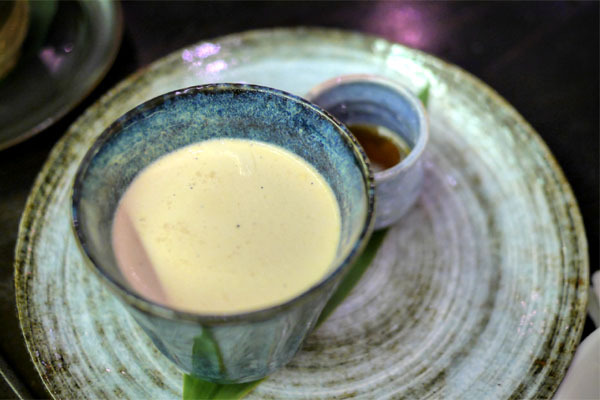 Last up was a pretty amazing panna cotta, one imbued with the bittersweet, roasty taste of hojicha. The tea flavors paired well with the intrinsic sweetness of the dessert, and the maple on the side gave up an extra hit of sugar to boot. 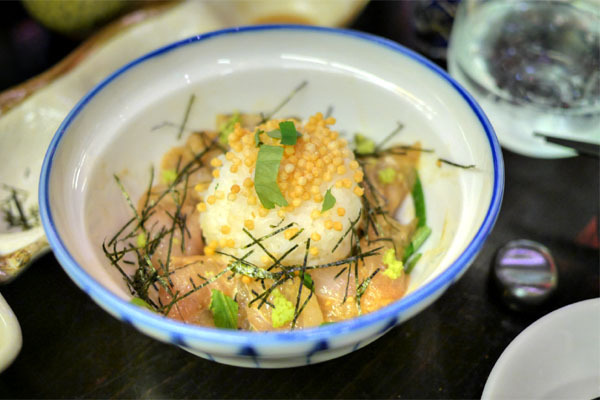 What Isogai and Kondo-san set out to do here at Kinjiro was to really give izakaya-style cookery the care it deserves, to elevate it. To that effect, it's clear to me that they've succeeded, with top-notch ingredients and spot-on technique, execution, and flavors. 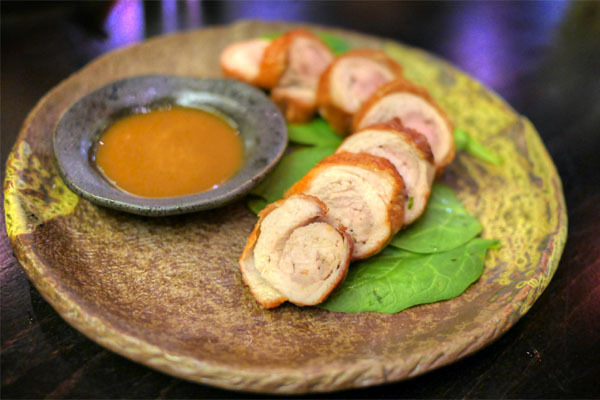 In fact, it was probably my best izakaya experience to date, and as far as I'm concerned, Kinjiro sets the new standard for such cuisine in LA. 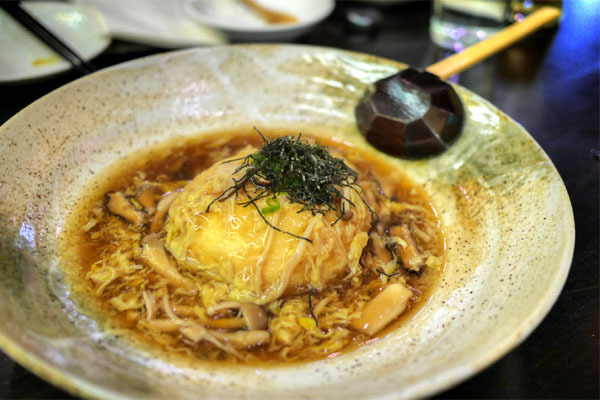 Fans of Japanese dining will certainly want to keep this place on their short lists. That looks very good. 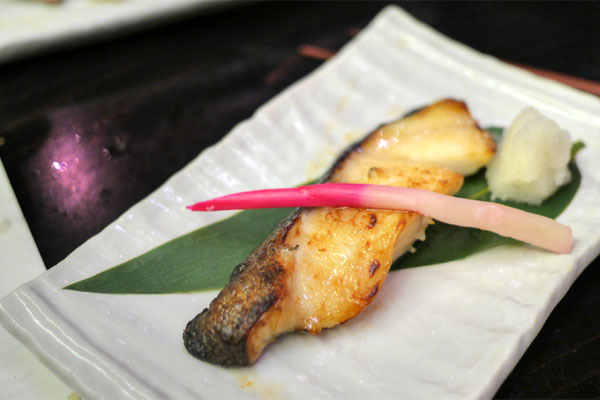 While some of those dishes are LA classics (miso cod, I'm looking at you), a lot of them seem fairly unique. 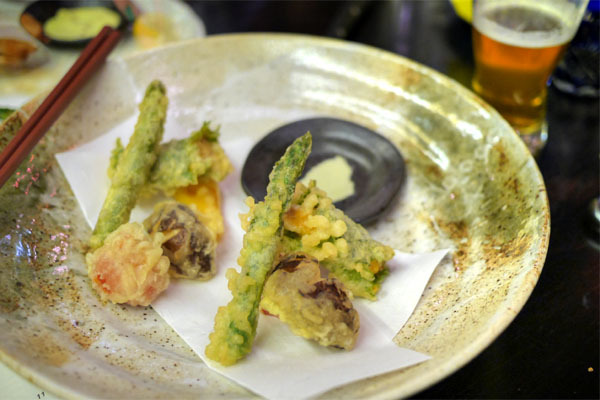 At least in that they are significantly fancified versions of traditional Japanese fare and not just the same old "nobu light" menus you get all over the place. It does Look way more "mainstream" than my meal at BOS with its bevy of odd parts. That being said BOS was extremely tasty. Andy, I'm going to set up a dinner at Kinjiro when I have time, will let you know. Food is quite good here as Kevin said. Thanks again Kevin. Hope to join you in some more future dinners once I get back in May. Darin had an amazing Instagram of these thick cuts of gyutan that I'm surprised you didn't order. I definitely need to try this place out! Kevin, I know you must be excited for the foie ban lifting. The Cascade Noyaux sounds like it would be an amazing ale. Andy: I don't think your link is working. But yes, do pay them a visit, especially if you're BYOB'ing. Charlie: Setting it up through Wine Berserkers again I assume? Justin: Yes, it was great having you. Peter: I was actually thinking about it initially, but it just slipped my mind. Bryant: I never thought I'd live to see the day. First stop is probably going to be Terrine. Anon: It was. Actually, most of Cascade's stuff is quite good. Pricey though unfortunately. nah, most of the dinners are typically set up via email among a core group of guys. More for getting together and hanging out than it being all about the wine. Yep, I did copy in a broken link. Here's the working one to the BOS write up. Charlie: Did you ever end up doing the dinner? Andy: Why the random Heady Topper in there? Fu brought the beer I think. Fine, but I'm not much of a beer guy as they are too bitter. I'm not that into bitter. Although I'm not 100% wine, I did just go to a CR8 last night where Matthew Biancaniello did a stunning job with cocktails paired to Roberto Cortez's food (writeup coming in a few days). I finally got to Kinjiro (with Charlie Fu). Full report can be found here. Paired it (the food) with 2002 White Burgundy :-). The food was very good, and very wine friendly. Much more approachable than BOS (which was also good, but "extreme"). Clearly more popular because they were turning people away crowded. I hope you will write more such novelties.